Do you get your abutilons confused with your punctatonervosus? Then look no further. Looking like a couple of gormless smiling evil aliens from Dr Who, are the two species of Scticopleurus we have in the UK. 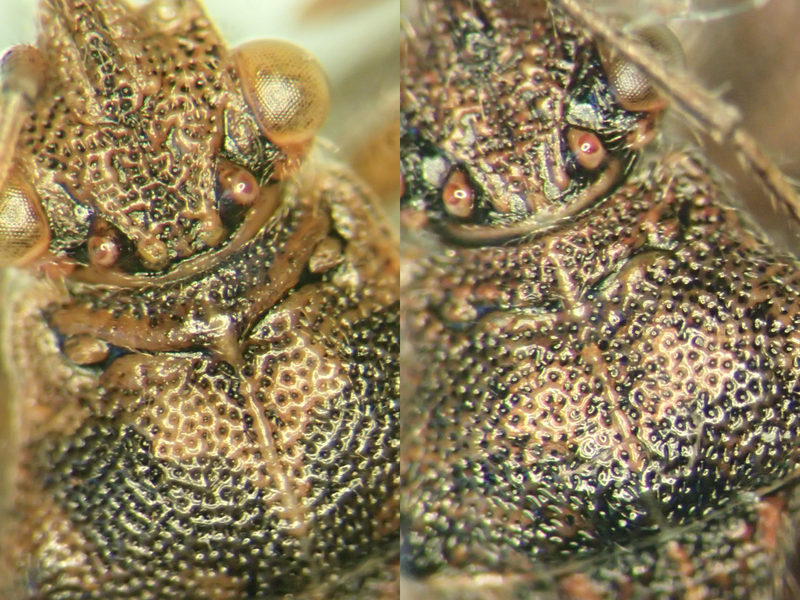 On the left we have Stictopleurus abutilon and on the right Sticopleurus punctatonervosus. Now in Sussex at least punctatonervosus is much commoner than abutilon. I have 23 and 3 records respectively. I see punctatonervosus all over but in huge numbers on Common Fleabane. It's all over Knepp and Butcherlands for example. I have never seen abutilon in in numbers like this though and don't know about any particular plant associations. How do you tell them apart though? Here we have S. abutilon. There is a curved pale ridge with no dark punctures present running almost parallel to the leading edge of the pronotum. As these are tough bugs, you can hold them in your fingers and see this with a hand lens easy enough. And the commoner S. punctatonervosus which basically doesn't have the unpunctured pale ridge. So that's that sorted then. As these two rhopalid bugs are both on the Sussex Shieldbug Atlas, you've got no excuse to not record them now. I await the flood of records. Somehow I don't think I will get double figures of these two in a year on iRecord (unlike the double figures of Western Conifer Seedbug I am getting on a nearly daily basis now). I can't get enough of waxcaps. I mean, look at them! They're some of our most charismatic species, they're also extremely good indicators of good quality, well-managed, nutrient-poor grasslands. On Tuesday I went on a grassland fungi training course at the Kent & Sussex Cemetery in Tunbridge Wells. Andy McLay of the Natural England Field Unit lea the course and Janet Whitman made the whole thing happen. Thanks to Clare Blencowe for inviting me too. There is a scoring system for five main groups of grassland fungi known as CHEGD. Each letter refers to the first letter of the genus. The H is for Hygrocybe or waxcaps and that's what I am particularly interested in. I had seen 16 species up until Tuesday but thanks to Andy we saw 11 species on the day and four of these were new to me making my list now stand at 20 in all. In the above image from top left to bottom right you have: Oily*, Blackening*, Parrot*, Snowy*, Goblet*, Crimson*, Earthy*, Splendid, Slimy, Scarlet, Golden*, Pink, Fibrous, Cedarwood, Dune, Meadow*, Honey* and Heath (I have no photos of Butter or Spangle*). Those with stars we recorded on the day. The best thing about the course was realising that these fungi are better identified from macroscopic characters rather than microscopic ones. The other was that I have always been worried I am overlooking Crimson Waxcap among the Scarlets and Splendids. I now realise that I have not been doing so, I have just never seen it before. Until Tuesday that is. Here is Crimson Waxcap, quite a beefy or blood-red colour with a robust and fibrous stipe. This is the Oily Waxcap. It smells of bed bugs apparently but having not seen a bed bug, I have also never smelt one. 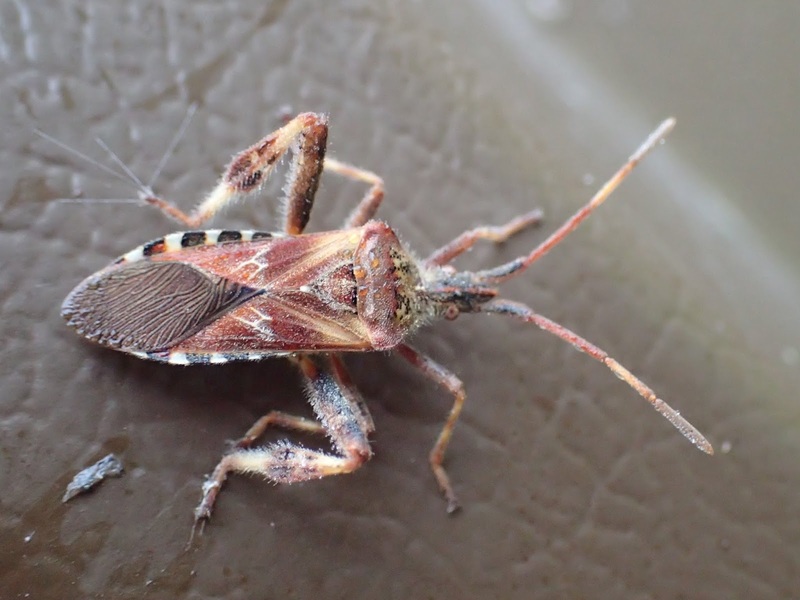 Turns out that the smell is actually just the general smell that most bugs release, it's the reason that shieldbugs are called stinkbugs in the USA. So I was able to temporarily 'acquire' a bug (a Juniper Shieldbug I found on the toilet wall). Once people had smelt the actual smell, it was much easier to pick up the same diluted version of the smell in the fungus. It's like an overpowering chemically-version of coriander. A great example of different areas of natural history interacting. Andy got excited about this one, the Earthy Waxcap, with unusually arched gills where they join the stem. Other than this it's a pretty boring looking one but it's a really good indicator. And Goblet Waxcap. A bit more matt to the naked eye compared to the miriad of shiny Spangle Waxcaps it was hiding amongst. Well spotted Clare! A bit 'scurfy' under the hand lens, you can just about see that here. This one's not a waxcap but it is the commonest member of the genus Dermoloma (or the D in CHEGD). Also known as Crazed Cap and you can see why here. I also realised that a waxcap that I stumbled across in Badlands back on the 14th July 2016 happened to be quite a goody. I don't think I ever featured it on this blog but here it is. Fibrous Waxcap. A big, robust waxcap, incredibly fibrous all over and with white-chocolate coloured (and textured) gills. The early fruiting time is also key, I wonder if that means it is under-recorded? That said, I have never seen it doing quadrats before anywhere. A massive thank you to everyone involved in this course, particularly Andy for sharing his incredible knowledge. 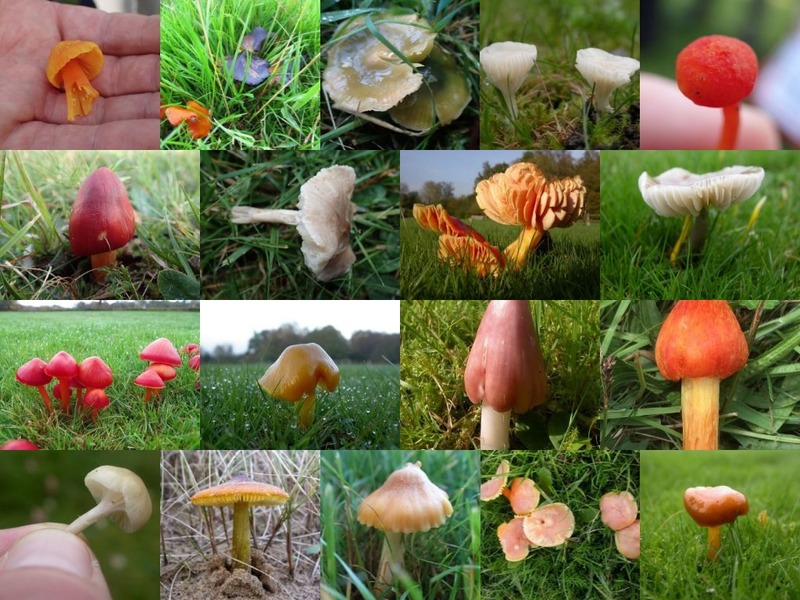 It has totally reinvigorated my interest in fungi and I am now thinking I might try and go and look for some of the other species we have in Sussex that I have not seen yet, Such as Toasted Waxcap. This just leaves me one question that I forgot to ask on the course. Why on Earth are they so brightly and variably coloured? What is the point?! Is it a deterrent to grazing animals? Introduced species are the second greatest cause of extinction. So it was bittersweet to catch the first Boxworm for a Trust reserve today at Southerham, this seems to be one of the most rapidly expanding introduced species right now. There were lot of migrants too, such as the smaller Palpita vitrealis you can see next to it. I used to think this was a real rarity. There were two of those in the trap last night too. So this image really conveys how much our moth fauna has changed, and continues to change, through Human behaviour. I'd never heard of either of these moths 20 years ago. Until today, I've only seen two Boxworms (in London) so I was pretty surprised to the melanic form, what an incredible moth. It has a purple sheen not unlike the Purple Emperor. Probably the best migrant was a single Small Mottled Willow. I've only ever seen a handful of these. There was also a Vestal. Several L-album Wainscot and White-points too. I guess you can't really call them migrants now being pretty well established. More aliens though. On the wall of the office was the first Western Conifer Seedbug for Southerham. A species from the other side of the Atlantic originally, it's now very well established. As verifier for Sussex records of Heteroptera in iRecord, nine records have come in today alone across Sussex! There was only one other shieldbug record in the same batch. This has been the trend for the last four or five weeks. I'm amazed at how many people who's names I don't recognise are recording this bug. iRecord really is a great way of capturing these records. So it might be another invasive but it's another big, impressive, eye-catching beast so at least it's getting people recording wildlife. Finally I was showing Alex some of these species in the fridge when I noticed a tiny piece of symmetry in amongst the mud on the floor of the kitchen Symmetry = invertebrates. It was only a lifer for me!!! Finally, a mouse spider! Scotophaeus blackwalli. Also a new record for any Trust reserve leaving us on 10,147 species. I wonder why I have not seen this synanthropic species until now. It is certainly not common in Sussex. Here is a celebration of how awesome tortoise beetles are. 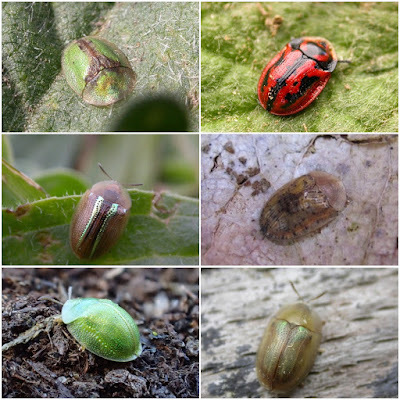 From top left going anticlockwise we have Cassida vibex, Cassida nobilis, Cassida hemisphaerica, Cassida vittata, Cassida nebulosa (the only one ever recorded in Sussex) and Pilemsotoma fastuosa. All of these have been recorded in Sussex. I have seen a further four Cassida species here but I have no photos of rubiginosa, viridis, flaveola or denticollis. 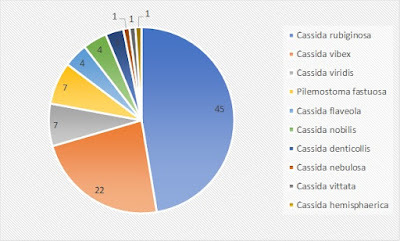 Of the 95 records in my database, almost half are of rubiginosa and a quarter of vibex. Here is how they break down. The two common ones are easy enough by sweeping thistle. Pilemsotoma is mainly on big stands of fleabane but seems to be scarce in the eastern end of East Sussex. I have only seen vittata, nebulosa and hemisphaerica once. It seems denticollis isn't that scarce around the Lewes Downs and on Sussex Uni campus on Yarrow (EDIT: but all three of my records were with a suction sampler). The striking nobilis is best seen by the coast. Kowabunga! 2.) in natural history: a relatively common species you really should have seen by now but through incompetence, indolence and/or bad luck, you ain't. Today, I finished my invertebrate surveys for the year wrapping up a survey of Iping and Stedham Commons. The very first suction sample produced this luminous little apple-green tortoise beetle. It's a real goody too, being a first for West Sussex. It's Cassida hemisphaerica, one I've always wanted to see. Not quite a bogey beetle in that sense, but it does look like something that fell out of your nose! It's a nationally scarce species and I'm pretty sure a new one for the Trust reserve network being only the third Sussex record! Odd that it feeds on campions, not a great deal of those on the heath. I love that suction sampler. It's a lot smaller than I had realised, and quite bright, with almost iridescent gold twinkly bits on it. The beetle that is, not my suction sampler. Look at his little face and feet! Soon after this photo shoot, it flew off and I can't find it anywhere!